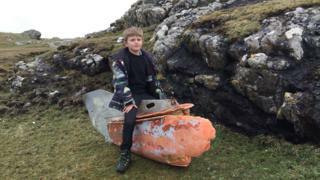 A piece of US Navy minesweeping equipment has been found during a beach clean on a Hebridean island. The item was among marine litter cleared away from a shoreline in the Isle of Tiree. Volunteers involved in the beach clean filled 12 rubbish sacks, according to the SCRAPbook project. The project, which involves Sky Watch Civil Air Patrol pilots and conservation groups, is mapping coastal litter in Scotland. It is the latest in a number of unusual items found during Scottish beach cleans. Last year, part of a controller for a game made in the former USSR in the 1960s was found at Fisherrow Harbour, Musselburgh. The plastic was from a Novo Raceways racing car set. Also last year, merchandise from a FIFA World Cup held more than 30 years ago was among piles of rubbish cleared from a Highlands beach. The cigarette lighter was made for Mexico 86. Lotion bottles from Russia and jam containers from Newfoundland were also among the 450lbs (204kg) of litter tidied away at Balnakeil, near Durness, in Sutherland.